My roommate and I set up our first Christmas tree together and I finally had a place to put all my gifts! It was so much fun going to the little lot around the corner from our apartment and picking out the perfect tree. 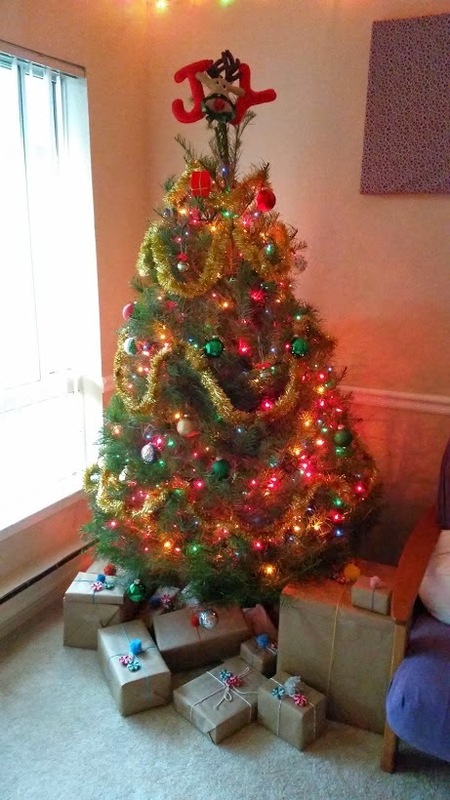 Our apartment is small, so we picked out an adorable 5 ft tree that fits great in our living room. What an adventure it was pulling out of the truck and carrying it up to our apartment all by ourselves. Once we put it up and washed all the sap off our hands, we started to decorate while listening to Christmas music of course! 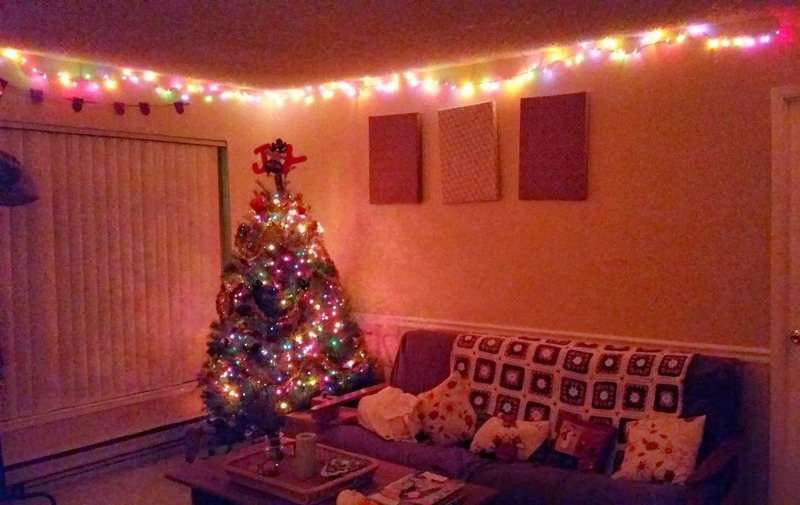 Luckily, I got a lot of hand-me-down ornaments and decorations from my parents (aka the ones they didn't want anymore or had extra of), so my apartment looks and feels so cozy for Christmas. The tree smells amazing too! I have completed my WIPs from my last post, Christmas Gifts. I made adorable little peppermint candies to hang from my gifts, and for the gift-receivers to hang on their trees as ornaments. Instead of going the traditional route with Christmas wrapping paper, I went the artsy-fartsy route with brown paper from the dollar store. 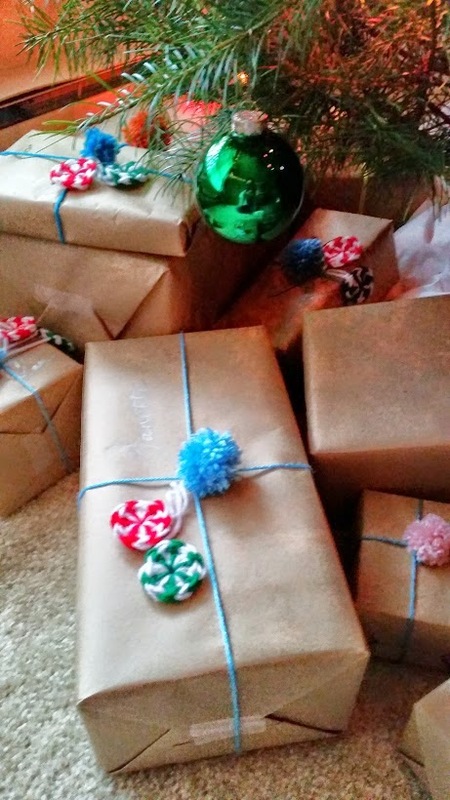 I boxed and wrapped each gift and topped it off with a hand-made pom pom. Not only is it cute, it's also a great way to use up all of that scrap yarn that I've been hoarding along the years. I stamped some gifts with people's names, but I found that I couldn't stamp perfectly each time and it was too much pressure since I kept messing up. I hate it when the square part of the stamp gets inked on. Any tips on how to stamp properly? Instead, I wrote their names with silver Sharpie. I think they turned out great, and I can't wait for Christmas to be here! I've been listening to an insane amount of Christmas music each day, so it's really building up the anticipation. Not much has changed since I was a kid.